Hi and welcome to The Legends car page. 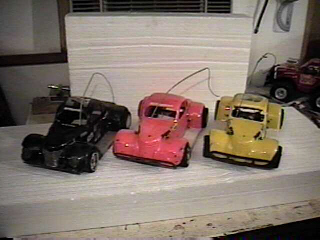 Here you will see some pictures of our 10th scale Legends cars. I have had a chance to share the race track with two of my sons at the same time. I will tell you that it is not only wild but lots of fun to have two of my boys in the same race as myself. The way things are going it will only be a year or two and I will have all three of my sons on the track along with myself. Here are a few pictures of our Legends cars. Here is a shot of our Legend race cars. The yellow car is mine. (DAD) Josh (10 ) drives the orange car and John (18) drives the Black car.